This is the time of year that many matric leavers will head down to the coastal towns of Ballito, Umhlanga and Plettenberg Bay for their end of school celebrations, more commonly known as Matric Rage. Often their first time away from home and without parental supervision, matrics spend 2 weeks partying in an environment that can become dangerous. 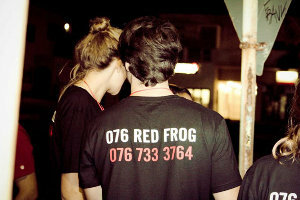 In 2005 a group of young South Africans realised the need for support and Red Frogs South Africa began. Red Frogs SA is a volunteer organisation whose sole purpose is to be a fun, sober and positive presence amidst the partying culture. Red Frogs SA started out with a group of friends and has since grown to nearly 200 volunteers, in 3 destinations around South Africa, for the 2 weeks of matric rage. Red Frogs SA 2012 kicked off on Saturday 24 November and the Matric ragers have already been phoning the Red Frogs’ 24/7 call centre. On the first night in Umhlanga a group of girls were afraid in their accommodation, as someone was banging on their door, and their first reaction was to call the Red Frogs and the Police, knowing that they could count on us. Not only are the Red Frogs around to help when things get rough, but they also provide alternatives to the binge-drinking and partying. “We’d rather be a fence at the top of the cliff, than the ambulance at the bottom,” Paul Rowney, National Director, explains. Last year in Ballito, dozens of Matrics hung out at the Red Frogs Pancake Stands, eating delicious free pancakes, drinking water, and having a great time meeting new people and chatting with mates. These alcohol free social environments are a welcome respite from the endless parties, and encourage young people to have fun without the reckless behaviour. The presence of Red Frogs is not only seen at Matric rage but they are also present at University O-weeks and at some of SA’s biggest festivals. Red Frogs SA understand that the decisions made in alcohol fuelled environments can have unwanted lasting effects and the Red Frogs volunteers, in every situation, uphold the dignity and integrity of those who find themselves in Red Frogs’ care. It is an social environment that lends to peer pressure and insecurity, and time and time again the Red Frogs volunteers have seen party goers choose to spend all night eating pancakes and hanging out with them. They also run party safe seminars at schools around the country, making matrics aware of what to stay clear of and who to call in emergencies. These seminars equip matrics with practical safety and general tips on how not to get kicked out of your accommodation and how to have a good holiday without any trouble. Red Frogs has been blown away by how, year in and year out, they receive the most incredible support. The communities banding together to assist in this initiative make this team of volunteers able to do what they set out to do, while building trust and friendship with the party goers.